Hello there, Sunday Weekend Warriors! Continuing in this series in hopes that those relocating to London are interested in learning more about British history, today we’ll meet yet another monarch, who is assuming the throne of last week’s Henry VI. We heard a bit about him last time, but allow me to now formally introduce you to King Edward IV. As a result of the War of the Roses, we now see the Lancastrian faction of the Plantagenet line phase out its rule of England to make way for the Yorkist one. 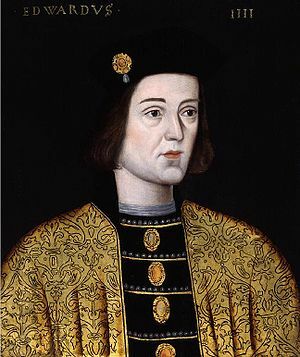 Edward IV had first ushered in the York dynasty in 1461 when Henry VI was exiled, as we learned last week. Allow me to revisit this time frame, then, from Edward’s point of view. Thus far Edward has succeeded with the aid of the Earl of Warwick, but Warwick is alienated when Edward avoids the foreign marriage he’d otherwise hoped to arrange for him by secretly marrying a commoner. “Royally” pissed off (ha-ha), Warwick unites with Edward’s brother George, the Duke of Clarence, in a revolt against the monarch before fleeing to join Margaret of Anjou (Henry VI’s queen) in the Lancastrian cause. It is at this time that Henry VI is briefly restored to the throne when Edward IV flees to the Netherlands in 1470 until the following year. Returning to England at this time in alliance with his brother Richard, the Duke of Gloucester, Edward kills Warwick at Barnet before proceeding to crush the Lancastrians in Tewkesbury. He reassumes his crown in 1471, and this is when we last saw Henry VI, executed at the Tower of London. Join me next week when we’ll learn of this second chapter of Edward IV‘s reign.